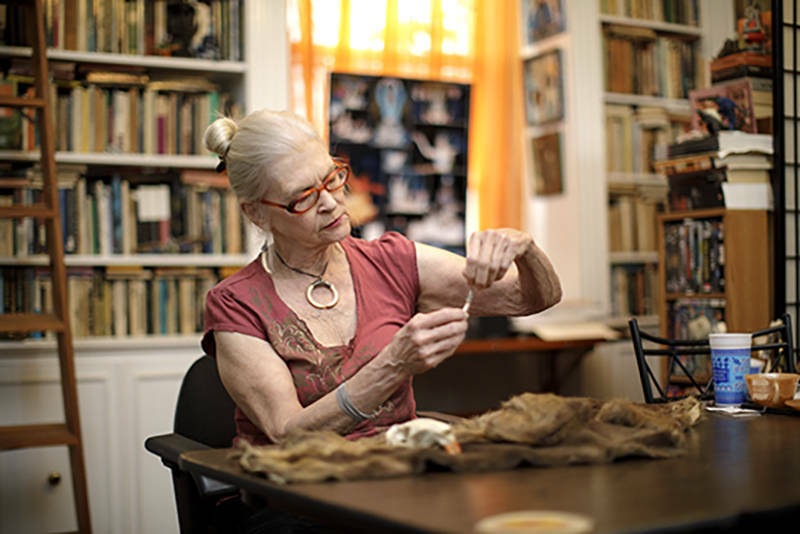 The centerpiece at this year's SF DocFest features vermin as the star performers. Rodents of Unusual Size tracks the destruction the humungous rat-like nutria have wrought upon the Louisiana wetlands. But the locals are fighting against this invasive and fast-breeding species of rodent with a variety of inventive responses (add "fur coat" to that memorable sign "Pets or Meat" from Michael Moore's Roger & Me and you'll get the idea). KQED went behind the scenes of Rodents Of Unusual Size with filmmakers Jeff Springer, Quinn Costello, and Chris Metzler. Who came up with the idea that the Louisiana nutria could be the basis for your documentary Rodents of Unusual Size? Chris Metzler: Many years ago when I was on the theatrical tour for Plagues & Pleasures on the Salton Sea, I became friends with a programmer who was from a generations-old Cajun family in the southeast part of Louisiana and she introduced me to the subject of nutria. Quinn Costello: I had heard about the nutria phenomenon from a friend who had been an environmental researcher in Louisiana. Jeff, Chris and I kept kicking around ideas about how best to approach the story. At one point we just decided that we needed to jump on an airplane and head to Louisiana. Jeff Springer: Once we got down there, you get taken in by beauty of the area, the sheer number of nutria that were destroying it, and the unbelievable dedication and joy of the people who were tackling the issue. How did you meet the charismatic Thomas Gonzales (a fisherman and now nutria hunter) and develop a relationship with him? QC: I was cold calling a bunch of nutria hunters ahead of our trip to Louisiana and somebody suggested Gonzales, “because he's the king of the nutria hunters.” As soon as he picked up the phone, I knew this was somebody that I really wanted to meet. When we met him for the first time, after about 10 minutes, we were on his boat checking out the area that had been ravaged by hurricanes. He had such a unique and joyful disposition despite having lost everything so many times. Everyone you film seems happy to talk about the subject. Did you have any trouble as outsiders in winning over the trust of the locals? JS: One hurdle that we had to overcome was the fact that there are so many reality TV shows that are being filmed in Louisiana. However, after spending time with folks with the camera turned off, they start to understand that we're really there to listen and to tell their story respectfully. Despite being outsiders, there was just this enormous amount of trust right off the bat. We were all amazed at that because it's something that is unique to that part of the country and it comes with their hospitality and their pride in their culture and good humor. There were a few people along the way that didn't want to participate because they had been caricatured negatively in the press and reality tv. One guy had received serious threats from animal rights groups because he trapped nutria. Even though he didn’t want to be filmed he ended up being a huge help in showing us around the area and introducing us to people. It was pretty rare for somebody to slam the door in our face. Did it take some getting used to filming all the corpses and scenes of skinning and hacked off tails? CM: It was definitely a new experience, as none of us are hunters. 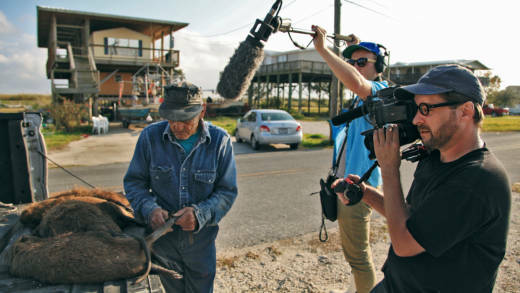 But with that said, putting ourselves in new situations is one of things we really enjoy about making documentaries. So at first I think we were just really curious. It probably was tougher for Jeff because — being both a director and cinematographer — he had put his face up close and personal with all of those nutria. JS: You would think so, but strangely, the camera wound up making it even easier to watch all of this happen. Looking through the lens or at the viewfinder creates a barrier to the action you are witnessing and so you feel a bit detached. But as the bodies pile up (any given hunt could yield a body count as high as 300 nutrias) and you look up from the camera, it quickly brings you back to reality. QC: And then after a while, when you see the destruction they cause and consider how many other animals are going to suffer because of that, we started to understand and accept that hunting is just part of what's necessary and controlling their numbers. Also, hunting is not just about collecting food. It's really an activity that bonds families together. 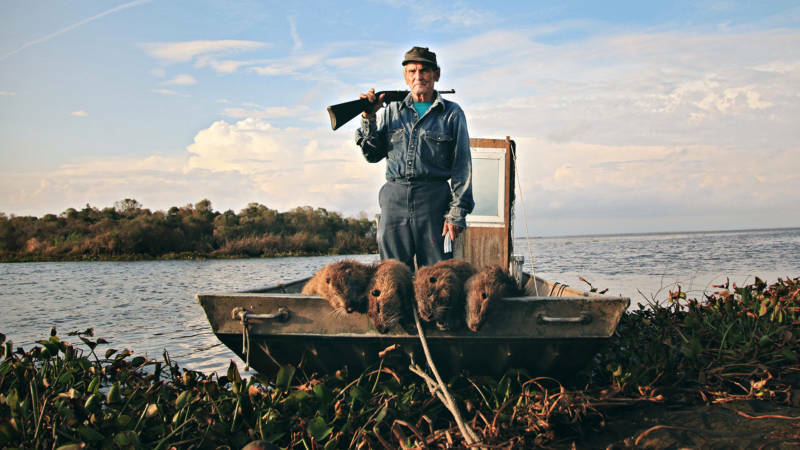 Is all of the hunting making significant progress against the numbers of nutria? The man trapping nutria at the suburban golf course: was he a private citizen? CM: The Nutria Control Program is making enormous strides in controlling their numbers. Over the course of the program, they've gone from more than 20 million down to about 5 million. I'd say that there has been a lot of success, although as Thomas says, “as long as there are two left, there's going to be millions more.” There is no way of getting around it: nutria like to breed and have lots of babies. JS: The man trapping nutria at the golf course is a professional animal control officer named Michael Beran. He has his own company called Wildlife Command Center and he gets hired out by various cities and private concerns like the golf course to eradicate nutria and other “problematic” animals. He’s a really great guy and we’ve been lucky enough to have him attend some film festivals with us. With SF DocFest, he’ll be part of the Q&A so that should be a lot of fun. 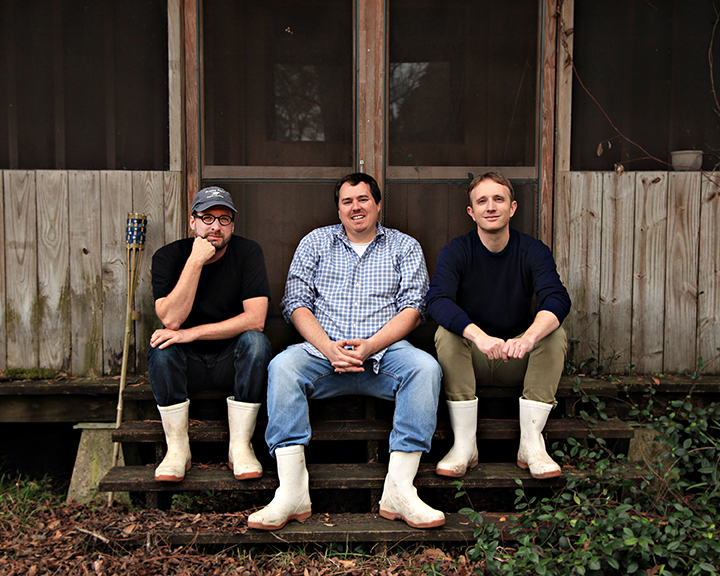 You offered nutria meat as a gift on the Kickstarter campaign. Did anyone take you up on that offer? CM: There was a disappointing lack of enthusiasm for that particular incentive, as people would choose it for a reward and then not want to receive it. We have a freezer still stocked with it. Anyone up for a San Francisco nutria BBQ? 'Rodents of Unusual Size' opens at the Alamo Drafthouse New Mission Theater in San Francisco on Friday, Aug. 31. For more information, click here.